Collected by: Lime Green Giraffe Marketing Manager, Kennedy J.
Hi my fellow Girl Scout Bosses! It's February 2018 and guess what time it is? You guessed it. It is Valentine's Day and Girl Scout Cookie season. 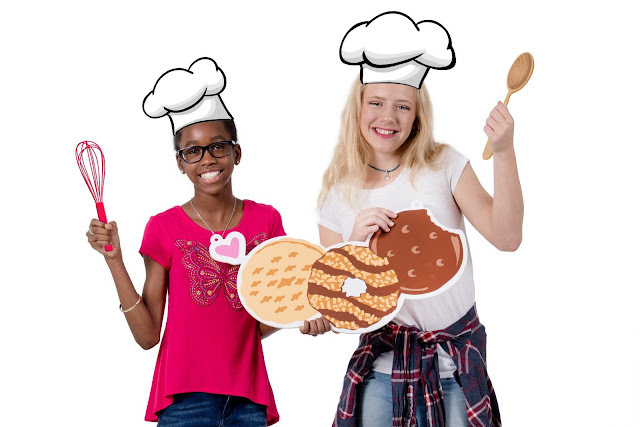 So, let me introduce some cool Girl Scout Cookies recipes or let’s call it Sweets and Treats. I am listing a sweet and treat for the Thin Mints, Trefoils, Tagalongs and S’mores. I would like to challenge you to post your favorite sweets and treats recipe along with a picture on Instagram @gigilgg or Facebook @LimeGreenGiraffe and hashtag #GiGiCookieRecipes. Let’s see who gets the most likes and I will feature you in my next article. 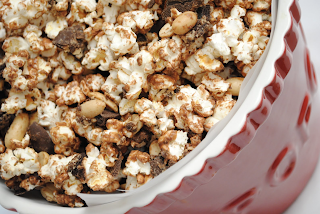 In a large bowl, combine popcorn and half of the crushed Thin Mints® cookies. In a microwave, melt baking chips with shortening; stir until smooth. Pour over popcorn mixture; toss to coat. Immediately spread onto waxed paper; sprinkle with remaining crushed Thin Mints® cookies. Melt baking chips in microwave; stir until smooth. Drizzle over popcorn; let stand until set. Cover cookie sheet or plate with waxed paper and set aside. Combine chocolate chips and butter in a small, microwaveable bowl. Heat for 15 seconds at a time, stirring in between, until chocolate is melted. 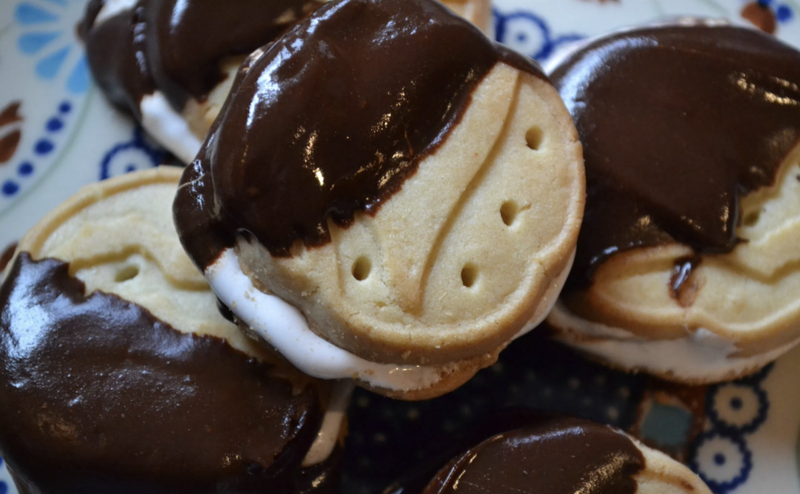 Spread marshmallow crème on one side of a Trefoil cookie. Add top cookie and dip halfway in chocolate mixture. Place cookie sandwiches on waxed paper and refrigerate for one hour before serving. The chocolate mixture also works great for chocolate-dipped strawberries or dried fruit. Yum! Mix together the melted chips and the popped popcorn in a large bowl. Use a rubber spatula to stir until popcorn is mostly coated. Roughly chop or crumble Tagalongs (Ashton used about 10) into the bowl. Roughly chop up peanuts (Ashton used a small handful) and add to the bowl. Mix again, until Tagalongs and peanuts are incorporated evenly throughout the popcorn. Spread on wax paper to cool and harden chocolate. For faster results you can refrigerate the mixture on the wax paper. Girl Scout Samoas Brownies: Adjust oven rack to the lower middle position and turn oven to 250 degrees. Line a 9x9 baking sheet with two pieces of aluminum foil to form a sling for easy removal of brownies. Melt chopped semi-sweet chocolate and cubed butter until smooth. Set aside. Whisk the eggs, sugar, vanilla and salt together. Whisk in warm chocolate into the egg mixture until just combined. Using a spoon, pour in flour and combine batter. Add in toasted coconut and chopped Samoas cookies, stir to combine. Pour into the prepared baking dish and spread out evenly. Bake for 35 minutes or until a tooth pick inserted into the brownies comes out nearly clean, with just a few crumbs hanging on. Allow to cool on a wire rack for at least 90 minutes before removing and cutting into 1" cubes for parfaits. There will be leftover brownies from this recipe. Coconut Whipped Cream: Place 1 cup heavy whipping cream into a large bowl or stand mixer bowl. Beat on medium until cream turns frothy. Beat continuously until the cream starts to thicken, slowly whip in sugar and coconut extract. At the very end just before stiff peaks form, add in additional coconut flakes if desired. 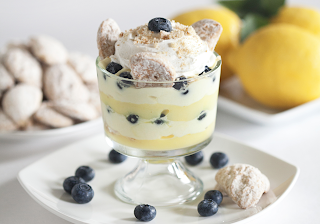 Set aside or chill until you are ready to assemble parfaits. Salted Caramel Sauce: Stir together sugar, water and corn syrup in a medium sauce pan over medium-high heat. Bring mixture to a boil, gently stirring to ensure all the sugar has melted. Boil until the mixture turns a dark golden brown, About 8-10 minutes. Remove from heat and VERY carefully and very slow stir the cream into the mixture, being sure to stir constantly. BE VERY CAREFUL, the sauce will sputter and expand - but keep stirring. Once combined, add the salt and butter and continue stirring until both are completely melted and combined. Cool to room temperature. Assembly: In bowls, ramekins or stemless wine glasses, dollop a bit of whipped cream into the bottom. Top with cut brownies and bits of chopped Samoa cookie. 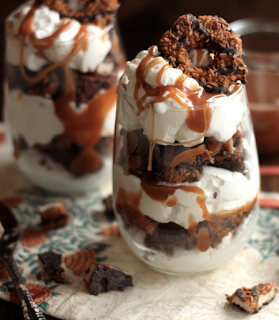 Drizzle with salted caramel sauce. Repeat process again until parfait reaches the top of the dish. Top with extra toasted coconut and one whole Samoa cookie. Prepare lemon pudding as directed. In a separate bowl, stir together with a spoon, 1 cup pudding and 1/2 cup whipped topping.